Relationships are give and take, Jesus calls us to follow him, serve, love others and have faith but, he is also giving; and so he asks "What do you want me to do for you?" take a moment to think about your answer. Yesterday, we saw that the father of a possessed boy wanted Jesus to help him with his unbelief. Today the answers go from asking for the highest honour; James and John wanted to be seated to the left and right of Jesus, to the most obvious; the blind man wanted to see. What you want can be very basic and obvious or the biggest thing you can think of. You cannot dream bigger than God. Maybe you're frustrated because you've told Jesus what he can do for you but he doesn't seem to be listening? Jesus wants to give you what you want because he loves you, but that love means that you don't always get what you're asking for. James' and John's request was for their own promotion, to be given the highest honour and to look important. They wanted to be the greatest. It is clear that this is not how kingdom promotion works. Jesus explains to the disciples that becoming great comes from living as the least. Jesus himself came to serve, not to be served (10:45). Like the two disciples it could be that you are asking with the wrong motive, but it's not only your motive but your attitude. Through the illustration of a fig tree Jesus shows the disciples that if they pray with faith that truly believes, they are able to receive anything in prayer and as you learnt yesterday, your attitude must be one of belief. There is a further hindrance of an unclean heart; if you are holding on to unforgiveness or sin then that needs to be cleared before coming to God. Jesus wants to do what you want him to and he is trying to show you how you can help him. Your decisions, your requests and what you want Jesus to do for you need to be measured. The most important thing in your life is your relationship with God and it is that you use as a measure. Does what you want measure up to the greatest commandment? More than sacrifice, service and offerings God wants your love. Not just a bit of it but all of it, heart, mind, soul and strength. Religion demands that the rules are followed and God is obeyed because, people are watching and judging how religious a person is. Relationship means that God is obeyed, not for others but only for the love of God. That love is demonstrated in your obedience and your love for others. Bartimaeus, a beggar, did not ask for money he asked for his sight, because of his faith Jesus gives him his sight to point to what love and faith in God can do. 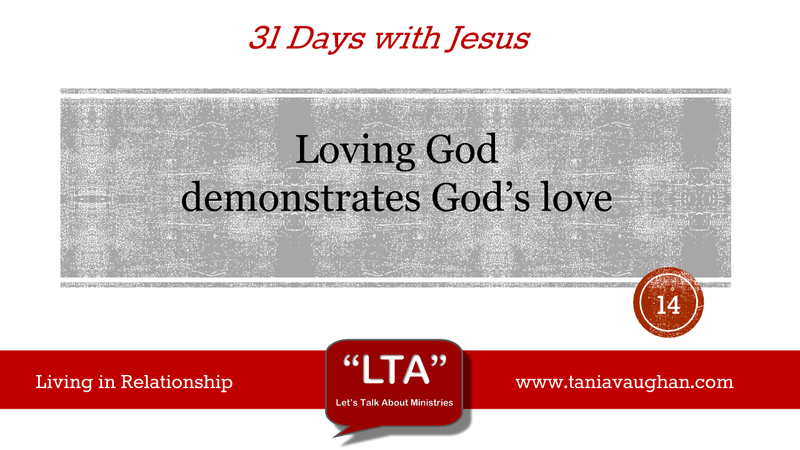 In answering this request Jesus demonstrates God's love. Jesus asks "What do you want me to do for you?" Does what you want show how much you love God? Does what you want demonstrate that love to others? Does receiving what you want point to God? Lord, I thank you that you speak to me, that you want to enter into conversation and to know exactly what I want you to do in my life. Help me to focus on the things that demonstrate my love for you and your love for others, so that I am not selfish in my requests. Lord, what I really want from you is to be in your will and to be in such a close relationship that I am in step with you. Have you ever prayed that there be a parking space or that the speed camera would not be working? I have! Is it that glorifying God? No of course there would be other things more worthy - maybe the prayer should have been "lord bless me with better time management and more self control so I don't need to speed". Do you think that if you prayed for courage that you wake up suddenly able to wrestle lions without your knees knocking together. No, God's way would to put you on a journey that will teach you to be courageous. It is interesting that JC replies "you do not know what you are asking". God has the master plan and sees the big picture - we can't. If we could how do you think it would change our attitudes? There's a great point here in the fact that when we pray we don't always know what we are asking.